John Shimkoski was born in South Florida and settled here in Orlando, where his wife Heidi was born, after spending over 25 years in the US Army. John learned to dive in the late 1960s while on a summer vacation to Freeport, Grand Bahamas. In 1976, he took a formal PADI training certification course. John was trained as a US Army Special Forces combat diver in 1979 and continued to expand his diving knowledge by becoming a diving supervisor, diving medical technician and diving instructor in the US Army Special Forces diving community. He also instructed scuba diving for the YMCA and currently is a NAUI instructor trainer. Scuba World’s roots in this community go all the way back to the days when sporting good stores were the only place to find swim and scuba (self contained underwater breathing apparatus) equipment. Ed Peasley was the owner of Edgewood Sports Center (later Jim Hollis´ Scuba World) located at Winter Park Road and Corrine Drive here in Orlando. Ed was one of the first businessmen to cater to the new sport of scuba diving in the 1950s and ‘60s. In the early years of scuba diving there was very little industry policing of the sport, and Ed did something that you would never see today, a coin operated air fill station, truly ahead of his time for diver convenience. Jim Hollis purchased the business from Ed in 1969, and for the next 30 years brought scuba diving to the residents of Central Florida. Jim was one of two early pioneers of the scuba industry here in Central Florida, the other being Hal Watts. Jim trained thousands to scuba dive. Many were trained all the way through the leadership levels. 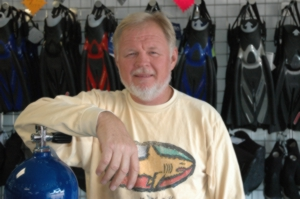 Today nearly every scuba store in Central Florida is owned and operated by someone Jim trained. In 1970, Jim moved Scuba World to its present location on East Colonial Drive, and this scuba shop has become the cornerstone for scuba diving in Central Florida ever since. In the 1970s Scuba World underwent several building and business expansions. The store was expanded to over 2,000 square feet of showroom, and the business expanded to 2 additional stores. Scuba II was opened on South OBT in 1978, and Scuba III was opened in Altamonte Springs on Highways 436 and 434 in 1979. Jim began the ‘80s by owning and operating a dive boat out of West Palm Beach, the Scuba IV. Scuba IV operated until 1987. The ‘80s were also a change in focus for Scuba World. Jim sold most of his satellite stores and the dive boat and reinvested in a rustic river getaway in Mayo, Florida. Jim Hollis´ River Rendezvous is still in operation today and is still owned and managed by Jim and his wife Cheryl. During the 30 years of owning and operating Scuba World, Jim organized and lead hundreds of dive trips to such places as Belize, Cozumel, Grand Caymen, Little Caymen, Caymen Brac, Jamaica, Roaton, Haiti, Bimini, Turks and Caicos, Walkers Cay and the Red Sea. Throughout this period students of Scuba World repeatedly explored the Florida Keys, both Florida Coasts and northern Florida springs. The 1990s brought a flat period in the scuba diving industry. Full service, individually owned scuba shops are now competing with chain stores, catalog sales and travel agencies for the 1% of the population that scuba dives. This led Jim to the decision to sell Scuba World and concentrate his efforts in his Swanee River resort, so in September of 1998 he sold Scuba World to John Shimkoski.